If you've read much about the ancient Mayan culture, you already know that their civilization was very advanced in terms of astronomy and calendars. Â There has been much controversy as to why the Mayan calendar ends in December of 2012. Â You'll find many, and extreme, interpretations of what this really means. Will life as we know it cease by 2013? If you'd like to learn more about what the Mayans predicted would happen in 2012, I recently found an interesting website and article that offers some insights on this topic. Â It provides balance to some of the rather outrageous interpretations you may have heard in regards to what the Ancient MayansÂ predicted for 2012. Â Click here to visit the website for the Foundation for the Study of Mesoamerican Studies, Inc. Earlier in the year I wrote about Ambergris Caye's first Mayan site to obtain the Maya Archeological Reserve Site status. Â This is the only reserve status Mayan site on an island and it's right here on our Isla Bonita. Â It will provide a unique opportunity for visitors to learn about Mayan history while visiting here. Local expat, Jan Brown, is the Founder and chairperson of the board for the Marco Gonzales' non-profit organization. Â It was her dedication and determination that resulted in the site receiving its special status. Â My blog posting about the Mayans and the background for this site was published in late April of 2011. Â If you missed that entry, click here to catch up on the background info - Ambergris Caye Mayan Site Receives Special Status. During the last year Jan has been energetically leading interested tourists on private tours of the site, for a nominal fee. Â At the same time, she's been working to obtain critical funding needed to build a visitor center and, long-term, an educational center. Ambergris Caye's local representative, Honorable Manuel Heredia, has been a big supporter of the site. Â Minister Heredia is Belize's Minister of Tourism, Culture and Civil Aviation. Â Last week he announced that he had secured the second part of the $20,000 donation he had promised the foundation. Â This money is being used to build the Phase One permanent boardwalk at the site. Once completed, the replacement boardwalk will allow visitors to safely pass through the wetland area between the road and the site, even in the wet season. The development of the Marco Gonzalez site is a huge undertaking. Â Belize's National Institute of Culture and History has estimated the cost at $1.5M USD for the Visitor/Educational Center, footbridge, parking lot, restrooms, security buildings, etc. Â In the desire to go "green", wind and solar power options are being explored, to compliment local electricity. Composting restrooms and recycled plastic "lumber" for the boardwalk are being discussed. Ms. Brown indicated that the initial donation set the stage for the non-profit foundation to more easily obtain funds from other international organizations. Â But, of course, Jan is not waiting for donations to magically appear. Â She and the other volunteers are actively seeking grants and donations to make this dream come true. Â It is a win-win project for San Pedro and Ambergris Caye. Soon Coming - the Marco Gonzalez 2012 Maya Calendar! But Jan and here volunteer team have also been diligently working on a special project. Â They are developing a 2012 Marco Gonzalez Mayan Calendar. She thinks this is the perfect way to tap into the increased interest in the Mayan calendar and the events predicted to transpire during 2012. Calendar sales will provide much needed funding to take the reserve site to the next level. Note that we are assuming the world will still exist in 2013! Â It might change, but we expect it to still be around. If you are interested in the mysterious Maya, be sure to check out the Marco Gonzalez site when you visit Ambergris Caye. 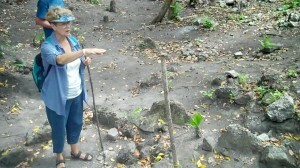 Â Given the recent funding, Jan has been able to hire a guide who's available to give tours. Â This will allow her to focus more of her time on fund raising. If you'd like to visit the site, donate to the foundation, or purchase a calendar, visit the website for more information. Â Â Just click hereÂ¦ The 2012 Marco Gonzalez Maya Calendar will be available in the fall of 2011, for $10 US, or $20BZ. Â The calendar will feature photos of the site, birds, animals found on site and a fun twist in December which will make you wish you'd ordered more copies for friends! To reserve your copy of the Calendar, please use the Contact Page to send an e-mail. Postage cost will be added for mailing. Â The website is relatively new, but they'll post info on the calendar when it is ready.